On the way to her first Seattle Boat Show, Fine Romance, a new 57-foot full displacement pilothouse trawler,was pummeled by 50-knot January winds as she left Victoria, British Columbia, and set a course across the Strait of Juan de Fuca. The strait is not a friendly place in the winter. It can be unfriendly and dangerous any day of the year. Running roughly east-to-west and about 80 miles long, the strait generates nasty and unpredictable seas that can hammer cruising yachts,even in milder winds.Seas rising in the Strait of Juan de Fuca are worsened and confused by water and wind flooding into it from the Haro and Rosario straits and Admiralty Inlet. The run from Victoria to the relative safety inside Admiralty Inlet is nearly 30 miles. Seas come from several directions at once but usually are on the beam all the way. A fair-weather crossing takes several hours; a rough trip seems to last for years. That day Fine Romance took all the ugly water the strait could muster. Her crew loved it. Switching on the Naiad hydraulic stabilizers eliminated most of the wild rolling caused by surging beam seas.The 70-ton fiberglass yacht pitched as she hit big waves head-on, and seas broke over her and crashed against the Portuguese bridge. But inside, the ride was tolerable and safe and the crew-the builder and owners-thought it a successful trial for a boat designed for world cruising. During the boat show, Roy Parkinson, whose Park Isle Marine built the boat, the first in its Royal Passagemaker series, and Al and Jane Castleman, the owners, talked about their challenging journey. There was no evidence of that storm-tossed approach to Seattle, of course, because nothing was warped, smashed, broken or hanging over the side. Her classic appearance, derived from traditional Pacific Northwest workboat styling, was the attraction that had people lined up on the dock. Toward the end of the show, Parkinson invited me to join Fine Romance for the trip home to Victoria. He and the Castlemans hoped rough weather would again demonstrate the seakeeping abilities of a hull known as the Seamaster when first designed for fishboat use more than 30 years ago by the late Ed Monk, one of Seattle&apos;s noted naval architects. It was an irresistible offer. While there were many interesting yachts in the show, the 57-footer appealed to brokers, dealers, builders and yacht lovers because of her tasteful and traditional design, the exceptional quality of the fiberglass and wood finish, the well-planned and spacious interior, and its heavy-duty, commercial mechanical and electrical systems. Whenever people gathered along the show dock, someone was bound to ask: "Have you seen the Park Isle boat?" The only question left seemed to be: How would she do at sea? I showed up shortly before 0600 on a cold January Monday, ready to go but not sure if I really wanted to bounce across the Strait of Juan de Fuca. Everything aboard secured for the anticipated rough-and-tumble trip, Al Castleman eased the yacht from the crowded boat-show moorage, using its single Caterpillar 3306TA diesel and the 25-hp hydraulic bow thruster, and headed across Seattle&apos;s Lake Union toward the Ballard Locks and the elevator ride down into Puget Sound. Within minutes, Castleman was navigating with radar and his chart plotter as dense fog settled around us. Fog, not wind or heavy seas, would be the thorn of this cruise. Outside the locks the fog clung to us and city lights disappeared. Fine Romance turned north on a rippled sea, navigating electronically. With Parkinson and Al Castleman in charge in the pilothouse, I went exploring. I had boarded via a temporary ladder over the rounded fish boat stern because show moorings made it impossible to use the bulwark doors on either side. Covered side decks lead forward from the cockpit, and heavy, watertight doors open to the saloon and engine room. In the lazarette are tanks for storage of fresh and used engine oil-enough volume for five oil changes for the main engine, the 90-hp Isuzu auxiliary drive engine and the 20kW generator that is driven by a second four-cylinder Isuzu diesel. Gasoline for the tender outboard engine is in a 110-gallon lazarette tank that is vented and drained overboard; a fitting in the transom permits the attachment of a fuel hose for easy refueling of the tender, and a two-switch system prevents accidental starting of the gasoline pump. To the right of the saloon door is a heated locker for storing wet clothing. There&apos;s no need to slop through the saloon in dripping foul weather gear. Maple is the featured wood, for cabinets and paneling. Cherry is used as an accent. Maple cabinet doors have a cherry grill insert; cherry cabinets have a maple grill insert. The cabinetry is fully functional, but the woodwork is so precise and flawless that it is more art than just a demonstration of a shipwright&apos;s fine skills. Next to the sofa is a china cabinet Jane designed. Built by the shipwrights at Park Isle Marine, it even makes use of storage space behind the toe space at the floor level. To test fit and appearance, she first built a mock-up of the cabinet using thin door skin material. Forward on the left is a U-shaped galley, with a propane range, homesized appliances and an abundance of storage space. Steps to the right lead to the pilothouse. Because it was busy with people navigating in the fog, I veered left and down to the stateroom area. At the foot of the stairway is a utility room, a space high on Jane&apos;s "must have" list for Fine Romance. In it are a stacked, full-sized washer and dryer, a large work sink, some counter space, a wine cooler and a medium-sized upright freezer. Cabinets house all the cleaning materials needed for housekeeping. Just like home. On other boats that space might be devoted to a third stateroom. That kind of utility area is seldom found on yachts of this size and probably prompts as many good visitor comments as any other feature aboard. Obviously, it is far more useful than an extra guest room. The master stateroom and head are beneath the pilothouse. Rectangular port lights provide a surprising amount of natural illumination. A walk-around queen bed has storage beneath and is surrounded by hanging lockers. Beneath the carpeted deck is the kind of storage needed on every world cruiser or liveaboard: space for large or bulky items, including suitcases and golf clubs. No other space is left vacant: Storage space in one cabinet extends deep beneath the stairway to the upper deck, for example. In the adjoining head, reached through a pocket door, a hidden cabinet appears when one opens a medicine cabinet door and flips a latch. Sliding out, it provides additional storage for cosmetics, medications, cleaning supplies ... and whatever. A guest head and stateroom are forward in the bow. The stateroom has stacked bunks and open shelving for books and magazines and space for Jane Castleman&apos;s office. Sliding filing cabinets are near at hand, beneath the lower berth. A small desk provides space for her computer, while a printer-fax-scanner is on a shelf above. Her computer is linked via a local area networking system with Al&apos;s computer and office area in the pilothouse, allowing them to share the single printer. A closet provides storage for office supplies, a portable sewing machine and other stuff needing a home. Fine Romance is home for Al and Jane Castleman. They have no other place to live. They are committed to the idea of world cruising and plan to be at sea for five to seven years, or longer. Someday they may move ashore and build a home on a small island, but they have no schedule. Their goal was to build a boat as comfortable and functional as any home on shore. And it also would be as safe and seaworthy as any yacht could be. So the boat is nicely furnished, it features a few pieces of Northwest Indian art, has a sophisticated entertainment center and a world-circling communication system. The Castlemans have a hot tub on the bridge, plenty of storage for the things they brought aboard and places where each may have some private time. "These are creature comforts," Al adds. "If this were just a boat, we wouldn&apos;t do it. But this is our home." The boat is stoutly built and finely finished. Clearly, the 57-footer will have no problem satisfying the Castlemans&apos; dream of world cruising and of having a comfortable home at sea. Building a boat also is about building relationships. Working together, the Castlemans have built a strong design-and-build team that is proving to be equally capable in yacht management and operation. They emphasize, too, that Parkinson and Greg Marshall, the Victoria naval architect who handled superstructure design and engineering, are key team players to whom they often turned for advice. A newer member of the team is Brent Parkinson, Roy&apos;s brother. A long-time commercial fisherman and holder of a professional mariner&apos;s 350-ton license, he had contributed advice on the project long before he joined Park Isle Marine. A product of teamwork is trust. Roy Parkinson says: "Once you establish trust, you can believe, you understand and you know." The Castlemans flew to Victoria often to check on construction. But they also talked hours on the phone with Roy Parkinson and worked email and fax systems hard. Questions and answers bounced back and forth, and the Castlemans said trust was so complete they knew the yard would do everything as they asked, just the way they wanted it done. "We knew exactly what we wanted," Al recalls. "And we did a good job of communicating with Roy, and he understood and did it." Parkinson actually started the boat for another owner, who unfortunately died when the 57 was only about half finished. Before agreeing to buy the incomplete boat and have Parkinson complete it, Al first called a respected California marine surveyor to check out the work Parkinson and his small crew had already completed. He said the surveyor reported that if the finishing work met the same standards as what had already been completed, it would be an excellent yacht. Because of the trust that developed, Castleman did not ask the surveyor to make a final inspection. He did, however, take some issues to the surveyor during construction and found that his answers agreed with Parkinson&apos;s recommendations. Trust can also lead to friendship. Hearing the Castlemans and Parkinson laugh and joke while navigating in the fog left no question about that. Early in their planning, Al and Jane each developed a list of things they particularly wanted in a boat that would be their only home for years to come. The lists were as follows. Superior electronics, with redundant systems for safety and reliability. Superior heating and cooling systems. Dinghy large enough for serious shopping trips ashore and long excursions. After several months of shakedown cruising in the San Juan Islands and the Gulf Islands of British Columbia, the owners report that they&apos;re pleased, and their plans for world cruising have strengthened. "We got all of the &apos;must have&apos; items and got all of the &apos;we&apos;d like to have&apos; items," Al Castleman says. "There were three or four features that were beyond our expectations, and we got them all." It came at a cost, of course. Parkinson estimates that a duplicate would be priced at about US$1.7 million. A less sophisticated model, without the redundant systems, elegant finishing or treasures-such as the oval stainless handrails-would cost about US$1.2 million. The efficiency of the boat design, Jane says, surpasses all expectations. "This is a very sophisticated boat," Al adds. "But the systems were all put together well." There have been a few "hiccups," Al says, "but we have been able to sit down and reason things through. And we have manuals for all the systems, and there are two file drawers full of manuals." While Al and Jane plan world cruising (both admire the ocean travels of Jim and Susy Sink aboard their Nordhavn 46, Salvation II), they also intend to get to know their new home well before making ocean crossings. They plan to take the boat south along the West Coast later this year, then to cruise north to Alaska next year. In total, they will have owned and cruised Fine Romance for two years before beginning their grand journey. That will provide hundreds of hours of operating time in which to get to know every piece of equipment and system thoroughly, and to continue to grow skilled as an operating team. If something is going to fail, it likely will happen in those first two years, near shore and not a thousand miles at sea. And by then, should a glitch develop far from shore, they should have gained the experience to deal with it. Puget Sound is broad and long and it is hard to get lost, even in the fog. But the real problem is that it is also a major thoroughfare for yachts, tugs and barges, tankers, container ships, and fishing vessels. A Coast Guard Vessel Traffic System guides the larger vessels, but great care is still needed when traversing the sound in poor visibility conditions. Fine Romance moved north that January day at reduced speed because of the weather, but by the time we neared Marrowstone Island the fog had become patchy, and we could see an occasional splash of blue sky. Vessel traffic was light, but a small Navy ship popped out of the fog and squawked its horn in warning. Because the sea was flat, I took an easy walk around the yacht&apos;s outer deck and discovered one of the most unusual and elegant aspects of Fine Romance: her handrails. Exterior teak being a high-maintenance no-no on most new yachts, builders today use stainless steel pipe for handrails. Parkinson and the Castlemans, however, selected a stainless steel handrail formed to fit the hand, as do the traditional teak variety. The soft oval shape is handsome and would offer a stout handgrip on a stormy day. Bending the oval steel rails is difficult, and Parkinson sent material for the bow pulpit area to the manufacturer in England for shaping. The engine room is aft, in a well-insulated space beneath the saloon, and the pilothouse is therefore whisper quiet. Our dining table conversation was as easy as it would be at home. With the fog retreating to occasional patches, blue sky beginning to appear over smooth water-and with good food, coffee and conversation-it was an enjoyable moment. The Castlemans carry electronic charts covering the world. Al tends to use the chart plotter for navigation, while Jane uses paper charts to plan and keep track of their cruising. Fine Romance has a small auxiliary gethome engine even though its Cat diesel is highly regarded on the Northwest coast for its ability to drive big fishing boats for months on end and to power large onboard generators that may run an entire fishing season without pausing. Diesel fuel is filtered three times before injection. The engine room has two independent fire suppression systems. The boat carries 1,320 gallons of water and a 500-GPD watermaker. For fail-proof operation, she has two Trace inverters, bow and stern anchor systems (with a hydraulic capstan in the aft cockpit), two radars (64- and 72-mile range), a single sideband radio, satellite communications and cellular telephones, as well as VHF radios and a weather fax. Finally, Al installed two emergency position radio beacons (EPIRBs). The yacht has 12 watertight compartments, each with a 3,700-GPH bilge pump and two high-water alarms. A 200-GPM emergency bilge pump connects all the watertight compartments. All proper stuff. If I were going world cruising, I&apos;d wear a belt and suspenders, too. Later, Al proudly led a tour of the engine room. The entry is through a glass door opening into the cockpit. Down a couple of steps and you&apos;re in this amazing place, an engine room and equipment center with lots of headroom. The centerpiece is the Cat diesel. Unlike engines on most new yachts, this Cat is not electronically controlled. While electronic engines normally are reliable, the use of a mechanical system reduces the chances of a bewildering engine shutdown far from port. Rated at 315 maximum horsepower at 2,200 rpm, the six-cylinder engine is designed to produce a continuous 190 hp. Although the Cat will push the boat at speeds up to 11 knots, Al finds the sweet spot is 8 to 9 knots. At 1,600 rpm, the boat cruises at 9 knots and burns 6.9 GPH, giving it a range of more than 5,000 miles on the 3,200 gallons of fuel it carries in three tanks. Fine Romance has a bulbous bow. Calculations indicate that it permits greater speed with less engine effort. For example, to reach 9 knots without a bulbous bow would require 1,800 rpm, a fuel burn of 8.79 GPH and would cut the yacht&apos;s range to a little more than 3,000 miles. On the starboard side of the Cat is the fourcylinder Isuzu wing engine. It&apos;s connected to a separate shaft and has a feathering propeller to reduce drag. Al says it will push the boat at about 6 knots. On the port side is a long workbench with tool drawers. The yacht has two large saddle tanks for fuel and a day tank built into the keel. Fuel is filtered as it flows into the day tank, and again as it leaves. The secondary filter on the engine provides a third polishing of the fuel. The Cat and the auxiliary and generator engines are all keel-cooled, in keeping with Al&apos;s goal to fit the yacht with "serious, workboat systems." On the forward bulkhead is a bank of 2-volt batteries connected in series to provide 12 volts and 2,800 ampere hours of storage. The batteries, of a style originally intended for submarine use and later adapted for industrial operations, are in a sealed compartment that is drained and ventilated to the outside. Inverters feed 120 VAC to onboard appliances. Fine Romance will be able to lie for days on the hook without using its generator. A Webasto hot-water system heats the boat in Northwest waters. There also is a six-unit Marine Air heat pump to provide cooling and heating in other climates. The 20 kW generator drives the air-conditioning system. When Al Castleman is working at the bench or servicing the engine, he can switch on the boat&apos;s stereo system and listen to his favorite music from the saloon CD player. Parkinson began construction of the Royal Passagemaker about five years ago in a small shed near his home on Becher Bay, near Sooke, a rural community west of Victoria. It was Parkinson&apos;s first major job as a boat builder, and problems in settling the estate of the original owner stopped cash flow and construction, leaving him wondering about his new career. Although Parkinson grew up on boats owned by his family, he had tried several other jobs- including logging-before deciding to take training in yacht design and construction. Then he launched Park Isle Marine, Ltd., acquired the molds for the 57 and a deckhouse design and began searching for his first customer. Simultaneously, the Castlemans decided they were serious about world cruising in a pilothouse yacht and began looking for the perfect boat. Californians who had done some sailing, they first tested their love for pilothouse styling with the purchase of a 45-foot Bayliner motor cruiser. While the Bayliner is not considered an ocean-going boat, they chose it because of its styling and relatively modest purchase price, which they assumed would be recovered when they sold it. They cruised along the Northwest coast for three years and continued research into outfitting a world cruiser. Notebooks were filled with photos, advertisements and articles about products and styling features they liked and disliked. "I tried to learn as much as I could from as many people as possible." Their belief in pilothouse styling affirmed by the Bayliner, the Castlemans began looking for their new boat. Al saw a Park Isle Marine advertisement in PMM and was intrigued. He flew north to check it out and eventually bought the unfinished boat from the estate of the first owner and contracted with Parkinson to complete it. Parkinson and a crew of four did much of the work leading up to launching, which was a somewhat perilous adventure involving placing the yacht on a large low-boy trailer and moving it down country roads to the shore. The owners and builder then drove it to a new Park Isle Marine yard in Esquimalt Harbor in Victoria for completion. Today, Parkinson has a crew of about 50 working to complete a 65-foot ocean-going trawler and preparing to start work on a 72- footer. Park Isle also owns molds for the Truant sail and powerboats and is considering production of some of that line. It can build the Royal Passagemaker in lengths ranging from 52 to 64 feet. 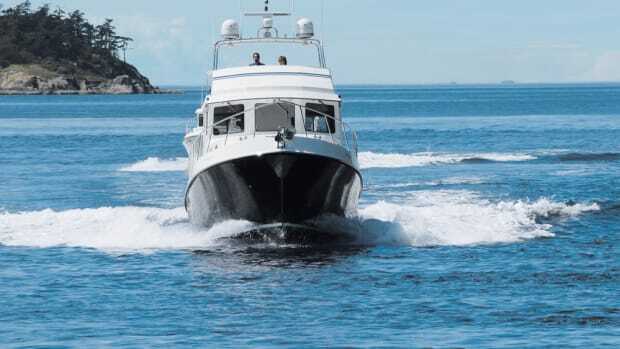 The design of the Ed Monk hull is noteworthy for its success over several decades in recreational and workboats that do not fear deep water far from shore. "During the late 1960s and early 1970s, Monk&apos;s designs for multipurpose fiberglass trollers... proved their worth among fishermen in the Northwest. Philbrook&apos;s Shipyard in Sidney, B.C., built four from the Seamaster mold, and dozens more were built throughout Puget Sound. "Peter Peterson of Sidney commissioned Miss Pacific in 1978, &apos;a very good seaboat for its size,&apos; which he took offshore for tuna, salmon and halibut." The molds moved around and were used to build many yachts, including Hi-Dad, a 55-ton ocean cruiser fitted with a Gardner 8L-B diesel engine. That vessel was a star in the movie Free Willy 2. Oliver credits the work of Monk (and Bill Garden, Al Mason, Weston Farmer and Walter McInnis) as inspiration for the contemporary ocean-cruising yachts of James Krogen, Steve Seaton and Jeff Leishman. Fine Romance encountered a light chop nearing the entrance to Victoria Harbor after the long run from Seattle. It was the roughest water we&apos;d seen, but the yacht acted as if it were a millpond. As a day planned to test a vessel&apos;s rough water capabilities, it had been a bust. Otherwise, it had been a wonderful day at sea aboard a fine yacht, with good people and excellent food. I flew back to Seattle the next morning in a small float plane that cruised at about 1,500 feet. A west wind was blowing hard into the strait, with an ebb tide opposing it. Swells were building and wind-driven seas were breaking, and gusts were carrying the spray for hundreds of feet. The wind must have been nearly gale strength. For anyone following the course of 98 degrees from Victoria to Point Wilson at the entry to Admiralty Inlet, it would be a long and unhappy crossing. But for Fine Romance it would have been a piece of cake.